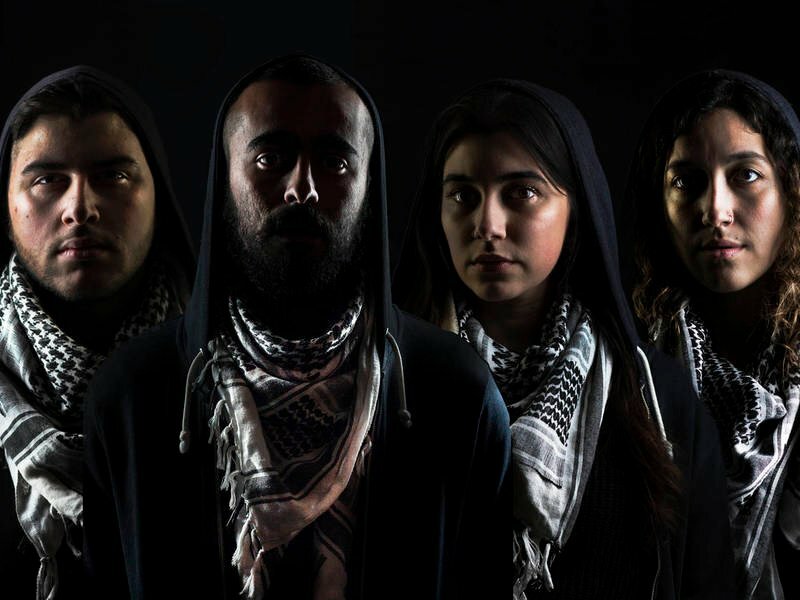 PHOTO CREDIT: (left to right) Chris Khoshaba, Salar Ardebili, Gloria Imseih Petrelli and Tina El Gamal in a publicity image for Interrobang Theatre Project's Chicago premiere of I CALL MY BROTHERS. Photo by Salar Ardebili. I got invited to see an early run of I CALL MY BROTHERS, written by Jonas Hassen Khemiri, directed by Abhi Shrestha, now playing with Interrobang Theatre Project at Rivendell Theatre (5779 N. Ridge Ave). The play functions as memory, fantasy, dreamscape, reality, all meshed together in an intricate mesh that challenges our own preconceptions about Arab culture around the world. The argument can be made (and heck, here I am making it) that nationalist/anti-immigrant attitudes are far worse in Europe than they are here, State-side. Set in Sweden in 2010, the play finds Amor, a young Arab-Swedish man, racking his brain to work through the relationships in his life: friends, family, unrequited loves, when all his thinking and rambling is further pushed over the edge after a car bomb explosion in his city. Now, anti-Arab/Muslim attitudes have invaded Amor’s own brain, making him question his own place in the world. Through his struggle, we begin to question our own perception of how we see our fellow Arab citizens day-to-day: where does your mind go when you see someone wearing a hijab, or a keffiyeh? What images pop into your mind? How does the world see you? Shrestha’s world is artful, painful, a sea of empathy wrapped in a theatrically engaging tapestry. We are thrown into memories and phone calls and flashbacks and never lose a sense of where we are in the story. The four-person cast is all tremendous and each find their time to command the narrative in their own way, lead by the propulsive Salar Ardebili. I hope y’all get the chance to see I CALL MY BROTHERS. It tells a story with characters we rarely see in the American Theater. And if we do see them, it is usually through the lens of a White Narrative. These are the stories we need to hear right now, and this is a shining example of the power of theatre as Empathy. Please see it if you can. some favorite theatrical moments of 2018.
elsewhere (on the facebooks), I posted my top 20 shows of 2018. But I ended up seeing 101 shows in total, so I wanted to share some memorable moments from some of the shows that, while not being in my personal “top 20,” still stuck with me in a powerful way that reminded me of what theatre is capable of. -”We’re in the Money” in 42ND STREET (Drury Lane Theatre). A complete reinterpretation of what this number, and what this show, can be. -Ben Franklin and his son, WIlliam, pathetically wrestling each other and cementing a flawed relationship in FRANKLINLAND (Jackalope Theatre Company). -Veronica Garza pulling out an accordion and passionately playing musical nonsense in 9 TO 5 (Firebrand Theatre). -Beth Hyland daring to even write a play about Chicago’s “favorite” awards ceremony in RED BOWL AT THE JEFFS (The Sound). -Gregory Fenner, climbing up a staircase during the pre-taped pre-show speech of HANG MAN (The Gift Theatre), placing a noose around his neck, “Thank you, and enjoy the show,” THUD. Blackout. And all that followed. -Hamlet (Daniel Kyri) and his father (Robert Cornelius) in the final moments of HAMLET (The Gift Theatre). A figurative (and literal) escape from the play that solidified Director Monty Cole making this play his own. -The final moments of THE HARVEST (Griffin Theatre). A congregation coming together in terrifying unison for what Josh (Raphael Diaz) can only interpret as the sign from above he’s been waiting for. -Every single terrifying puppet in THE WALLS OF HARROW HOUSE (Rough House Theatre). -Lawrence Grimm’s first spoken line in SMALL MOUTH SOUNDS (A Red Orchid Theatre), completely shattering our perception of the play up to that point. -Neala Barron’s performance in 110 IN THE SHADE (BoHo Theatre). A soul laid bare onstage. -Any and all mentions of Tumbldn High in RIGHTLYND (Victory Gardens Theater). For those who know EXIT STRATEGY, the sheer terror of what’s to come next in Ike Holter’s theatrical saga. I’ve been thinking more and more about my own show-going/culture consuming/critical output, and as of this writing, unless you read my reviews with Newcity Stage, or are friends with me on Facebook, there isn’t really a concrete place for me to write about theatre, or any kind of cultural criticism in general. So, I think that’s what this space is going to be, starting in 2019. A place for be to, hopefully on a weekly base, gather some thoughts on the culture I consumed that week (that which I am not being paid to write about) and process it all here. If you’re up for that, I’d love for you to read along and leave a comment if you so choose as well. I’m looking forward to getting some more concrete thoughts on the world of culture, and especially the world of Chicago theatre, out into the world. Or, at least on my website, for whatever that’s worth.